A SIMPLISTIC ASSESSMENT of events across the North, and Belfast especially, since the beginning of last December would be to assume nothing has changed. A ‘Groundhog Day’ scenario. 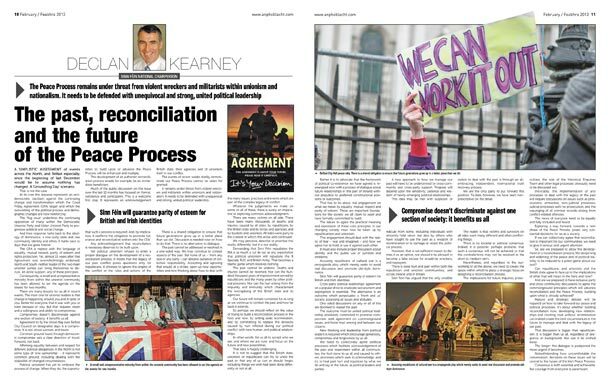 At its core this impasse represents an anti-democratic backlash against the continuing change and transformation which the Good Friday Agreement (GFA) began and which the outworking of the political process and demographic changes are now reinforcing. The ‘flag issue’ underlines the continuing opposition of many within the Democratic Unionist Party and Ulster Unionist Party to progressive political and social change. And their response harks back to the ideology of dominance, a one-party state and one community identity and ethos. It harks back to days that are gone forever. The GFA is replete with the language of equality, mutual respect, parity of esteem and rights protection. Yet, almost 15 years after that Agreement was overwhelmingly endorsed, North and South, neither leader of the two main unionist parties can bring themselves to discuss, let alone support, any of these principles. Consequently, a small and unrepresentative minority from within the unionist community has been allowed to set the agenda on the streets for two months. There are many lessons for us all in recent events. The main one for unionist leaders is that change is happening around you and in spite of you. Better for everyone that it was with you or even because of you. But that requires vision and a willingness and ability to compromise. Compromise doesn’t discriminate against one section of society: it benefits us all. Agreement to fly the Union flag over Belfast City Council on designated days is a compromise. It is not about winners and losers. Common ground found through democratic compromise sets a clear direction of travel. Forward, not back. Affirming equality between and respect for different political allegiances in the North is not some type of ‘one-upmanship’ – it represents common ground, including dealing with the realpolitik of changed circumstances. Political unionism has yet to embrace the process of change. When they do, the opportunities to build upon or advance the Peace Process will be enhanced and multiply. The development of an authentic reconciliation process would, for example, be an immediate beneficiary. Much of the public discussion on this issue over the last 12 months has focused on format, substance and participants. This is a welcome first step. It represents an acknowledgement that such a process is required. And, by implication, it reaffirms the obligation to promote tolerance and reconciliation written into the GFA. Any acknowledgement that reconciliation is necessary deserves to be built upon. Yet political unionism refuses to enter a proper dialogue on the development of a reconciliation process. It insists that the legacy of our past conflict poses questions only for republicans. It chooses to ignore the origins of the conflict or the roles and actions of the British state, their agencies and of unionism itself in our conflict. The events of recent weeks starkly demonstrate our Peace Process cannot be taken for granted. 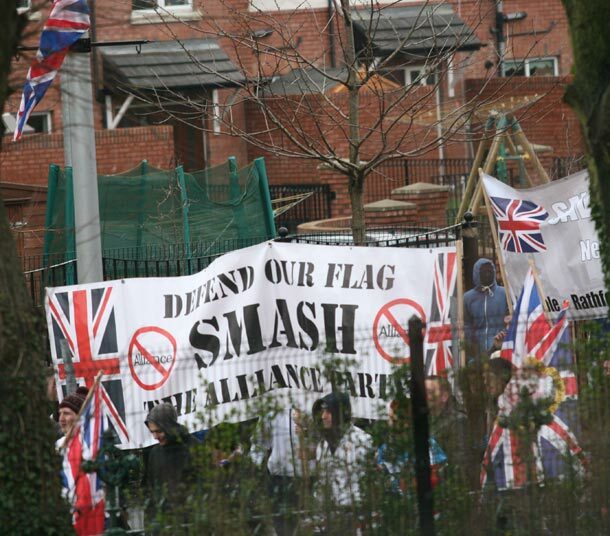 It remains under threat from violent wreckers and militarists within unionism and nationalism. It needs to be defended with unequivocal and strong, united political leadership. There is a shared obligation to ensure that future generations grow up in a better place than we did. Discussion is needed now on how to do that. There is no alternative to dialogue. The past cannot be addressed or resolved in a one-sided way. We may continue to contest aspects of the past. But none of us – from any side or any party – can absolve ourselves of collective responsibility. Accepting and agreeing that would, at a stroke, open up new opportunities and new thinking about how to deal with the many issues, practices and events which are part of the complex legacy of conflict. Whatever the judgements we make on some or all of these, there is surely an imperative in exploring common acknowledgment. There are many victims on all side. There have been many thousands of deaths and injuries, caused by all sides: by republicans, by the British state and its forces and agencies, and by loyalists and unionists. All sides were party to the context in which this arose and continued. We may perceive, describe or prioritise this reality differently, but it is our reality. Demanding that Sinn Féin repudiates the IRA is as much a cul de sac as any expectation that political unionism will repudiate the B Specials, RUC and British Army. That becomes a blame game which resolves nothing. The past cannot be undone. Deaths and injuries cannot be reversed. Nor can the hundred thousand years of imprisonment served by republicans and the many years by other political prisoners. Nor can the hurt arising from the impunity and immunity which characterised the wrongdoing of the British state and its agencies. Our future will remain contested for as long as we continue to contest the past and how far back it extends. So perhaps we should reflect on the value of trying to build a reconciliation process in the here and now, by setting aside recrimination, and by committing to replace the divisions caused by hurt inflicted during our political conflict with new human and political relationships. In other words: for us all to accept who we are, and where we are now, and focus on the future and new possibilities. That idea is hugely challenging. It is not to suggest that the British state, unionists or republicans can try to undo the past or that any of us can or should forget, including things we wish had been done differently or not at all. 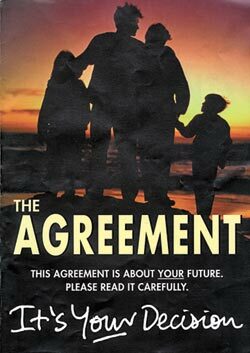 Rather it is to advocate that the framework of political co-existence we have agreed is re-energised now with a process of dialogue about future relationships in this part of Ireland without prejudice to preferred constitutional positions or outcomes. That has to be about real engagement on what we mean by equality, mutual respect and parity of esteem. These are important foundations for the society we all claim to want and have formally committed to build. The failure to agree the practical meaning and expression of these core principles in our changing society must now be taken up by republicanism and unionism. This engagement should deal with the reality of fear – real and imagined – and how we agree not to hold or use it against each other. It must also include proper discussion about identity and the public use of symbols and emblems. Accusing republicans of cultural war is a propaganda ploy which merely seeks to avoid real discussion and promote old-style dominance. Sinn Féin will guarantee parity of esteem for British and Irish identities. Cross-party political leaderships’ agreement on a popular drive to eradicate sectarianism and segregation is essential. The alternative is an outcome which perpetuates a ‘them and us’ society, polarising all issues and attitudes. One-sided discussions on any or all of this are doomed to repeat the past. The outcome must be united political leadership absolutely committed to promote compromise, seek agreement on commonground issues, and foster trust among and between our citizens. New thinking and leadership from political leaders is required which encourage generosity, compromise and forgiveness by us all. We need to collectively agree political processes which facilitate acknowledgement of the pain and resentment within all communities, the hurt done to us all and caused to others; processes which seek to acknowledge, and try to heal past hurt and injustices by what we do and say in the future, as political leaders and parties. A new approach to how we manage our past will need to be underpinned by cross-community and cross-party support. Progress will depend upon the sensitivity, patience and wisdom of newly-emerging political relationships. This idea may be met with suspicion or ridicule from some, including individuals with sincerely-held views but also by others who have sought to use the past as a weapon of recrimination or to damage or retard the political process. However, that is not sufficient reason to dismiss it as an option, nor should it be allowed to become a false excuse for would-be wreckers, and naysayers. There is deep hurt and pain within both the republican and unionist communities, and across Ireland and in Britain. Sinn Féin has argued that the only credible option to deal with the past is through an all-embracing, independent, international truth recovery process. We are the only party to put forward this position. To date, however, we have been non-prescriptive on the detail. The reality is that victims and survivors on all sides want many different and often conflicting things. There is no societal or political consensus. Indeed, it is possible, perhaps probable, that such a consensus will not be achieved or that the contradictions may not be resolved in the short to medium term. Nevertheless, and regardless to the outworking of all the above, we need to create the space within which to place a strategic focus on designing a reconciliation process. The implications for future inquiries, prosecutions, the role of the Historical Enquiries Team and other legal processes obviously need to be discussed out. 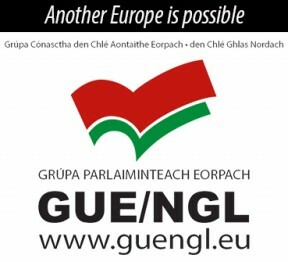 Inevitably, the implementation of any processes to deal with the legacy of the past will require discussions on issues such as prosecutions, amnesties, non-judicial processes, judicial processes with no prosecution, and the expunging of all criminal records arising from conflict-related offences. The views of everyone need to be equally and fully included and heard. Exploring a way forward, towards a new phase of the Peace Process, poses very substantial decisions for us as a society. If we can collectively agree that reconciliation is important for our communities, we need to give it serious and urgent attention. So, are we prepared to allow the development of a reconciliation process, the deepening and widening of the peace and of political stability to be reduced to a poker game about our past? Can republicans, and unionists and the British state agree to face up to the implications of what that will mean in the here and now? And are we prepared to have inclusive party and cross-community discussions to agree the commonground principles which will advance reconciliation and the Peace Process, building upon what is already achieved? Mature and strategic debate will be required on how to take forward our peace and political processes. It’s about whether building reconciliation now, developing new relationships and creating trust without recrimination can indeed create the best circumstances in the future to manage and deal with the legacy of our past. That discussion is bigger than republicanism. It is bigger than us all, regardless of allegiance or background. Nor can it be wished away. The longer this dialogue is postponed the more urgent if becomes. Notwithstanding how uncomfortable the conversation, decisions on these issues will be central to the future of the Irish Peace Process. Consensus is both essential and achievable. But courage from everyone is paramount.